One of our goals at Google Cloud is to offer all the database choices that you want as managed services in order to remove operational complexity and toil from your day. We’ve got a full range of managed database services to address a variety of your workload needs. We’re always working to add features to our databases to make your work building apps easier. Today at Next London ‘18, we’re excited to announce the general availability of two important new features for two of our cloud-native database offerings: Cloud Spanner and Cloud Bigtable. Cloud Spanner: We’re adding enhancements to Cloud Spanner’s SQL capabilities to make it easier to read and write data in Cloud Spanner databases using SQL, and use off-the-shelf drivers and tooling. Cloud Spanner’s API now supports INSERT, UPDATE, and DELETE SQL statements. Cloud Bigtable: We’re offering Key Visualizer so you can see key access patterns in heatmap format to optimize your Cloud Bigtable schemas for improved performance. We’re adding this feature so you can build optimized data models to get the most out of your database. Key Visualizer is now generally available. To build the databases that you want, our process is simple. We listen to you, and then we build features and products to address your needs. If you have something you want us to build, let us know. Read on for more details on these useful new database capabilities, which add compatibility and ease of use for your cloud workloads. Along with DML support in Cloud Spanner, we are also releasing a new version of our JDBC driver that now supports writes, in addition to SELECTs. This update makes it easier to reuse existing code and tool chains, so you can integrate with popular object-relational mappers (ORMs). This reduces the learning curve for new Cloud Spanner users and makes porting existing applications easier. To get started, see the documentation. The Key Visualizer feature, now generally available, helps visualize key access patterns to enable schema and performance optimization in Cloud Bigtable, our fully managed NoSQL key-value and wide-column database service. Cloud Bigtable is built for high throughput and low latency at any scale and is relied on for time-series, graph, and IoT workloads. We've heard from developers the desire for more visibility into their application behavior to optimize database schemas and get the most performance from their database—and we've built Key Visualizer to address this need. 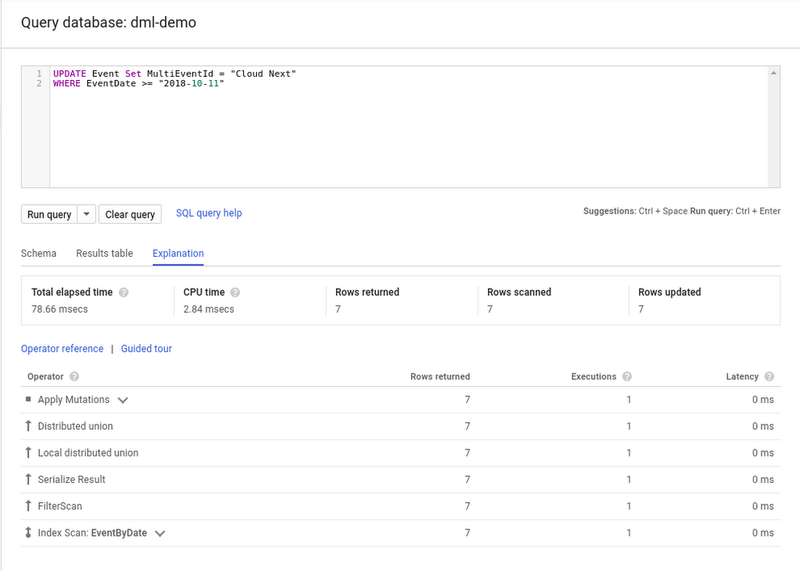 Key Visualizer has helped many teams here at Google and Google Cloud customers by providing them with insights into their database usage patterns, without impacting the serving capabilities of the database itself. This means you can design and refine your data model to best take advantage of the horizontal scalability of our GCP services.This functionality hasn’t been previously available for databases, but it’s an essential part of maximizing the performance of your applications. Key Visualizer helps debug performance issues that are caused by unbalanced access patterns across the key space, or single rows that are either too large or receiving too much read or write activity. 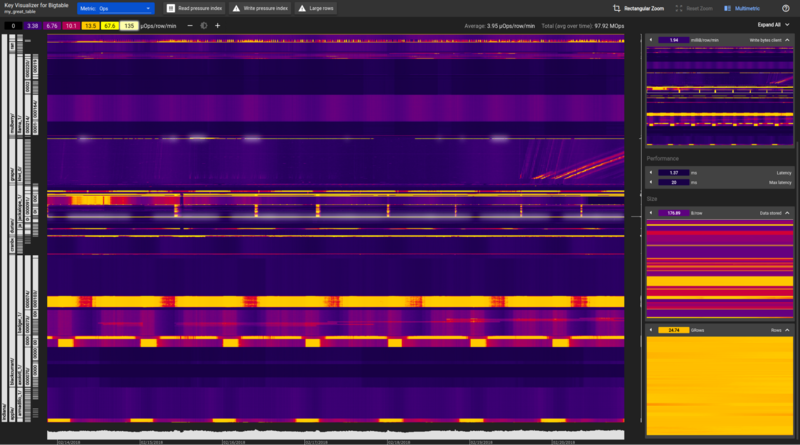 With Key Visualizer, you get a heat map visualization of access patterns over time, along with the ability to zoom into specific key or time ranges to find more details about the hotspotting keys. This tool provides clear insights into the access patterns of a table, helping you resolve performance problems due to schema design quickly. Key Visualizer is free and works at any scale, without any impact to Cloud Bigtable cluster performance. We’ve heard great feedback from customers who have been using Key Visualizer in beta to achieve their performance objectives. With this launch, we are also adding a new feature: Multimetric views. This lets you view multiple metrics at the same time when you want to compare metrics or find correlations between them. For more information on using Key Visualizer, check out this Google Cloud Next ‘18 presentation by Steve Niemitz, Staff Software Engineer at Twitter, together with Misha Brukman and Wim De Pauw from our team here at Google. These features continue to bring a better development experience to our managed database offerings so you can build apps faster. We look forward to seeing what you will build next!